I Will manually create 5 WEB 2.0 with 5 EDU and GOVbacklinks, Link-building is one of the most powerful methods that have a tremendous impact on Search Engines Optimization call SEO to rank your DA, PA and TF . These quality backlinks are very helpful for your website sbecause most of the backlink pages contain your website detail such as title, description of the site and your powerful keywords tags. Most of my backlinks are do follow but some of them are no follow. 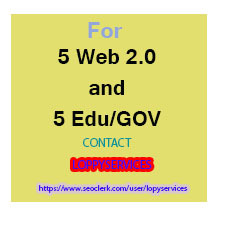 GET 5 WEB 2.0 WITH 5 EDU/GOV BACK TO BOOST YOUR RANKING is ranked 5 out of 5. Based on 8 user reviews.